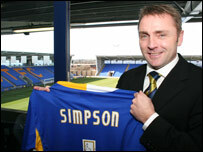 Former Preston boss Paul Simpson has been unveiled as the new manager of Shrewsbury Town. The 41-year-old watched Shrewsbury draw 0-0 with Darlington in Tuesday's League Two clash at Oteley Road. "My first job is to make sure we're in League Two next season and then we'll build from there," Simpson told BBC Radio Shropshire. Shrewsbury had been searching for a new manager since Gary Peters left the club last week by mutual consent. Simpson added: "I'm delighted to get this opportunity here. I think it's a club that can move forward. "I want to give the fans something to watch. I want it to be entertaining football but most of all I want to play winning football." "I want to get the players playing to their potential. I believe there is much more to come from them. It's a decent squad, but I'll want to make changes. "I'm coming in with an open mind. I've got no set ideas." The former Manchester City, Oxford, Derby and Wolves winger led Preston to the top of the Championship in 2006 before his dismissal in November.